The automaker's debacle has caused other vehicle manufacturers to investigate their own ignition switches and other potential defects. DETROIT – The ignition switch recalls now engulfing General Motors and Chrysler are raising new questions about the safety of the parts across the American auto industry. GM’s safety crisis deepened dramatically Monday when the automaker added 8.2 million vehicles in North America to its ballooning list of cars recalled over faulty ignition switches. GM has now issued five recalls for 17.1 million cars with defective switches, spanning every model year since 1997. • 2.6 million: The number of older small cars, including the Chevrolet Cobalt, that GM recalled in February to fix faulty ignition switches that it knew about for more than a decade. The recall touched off a review of ignitions in other GM vehicles. • 17.1 million: The number of GM vehicles recalled as of Monday for ignition-related defects. Since the February recall, GM has issued five more recalls of ignitions as well as keys that may easily bump out of position. 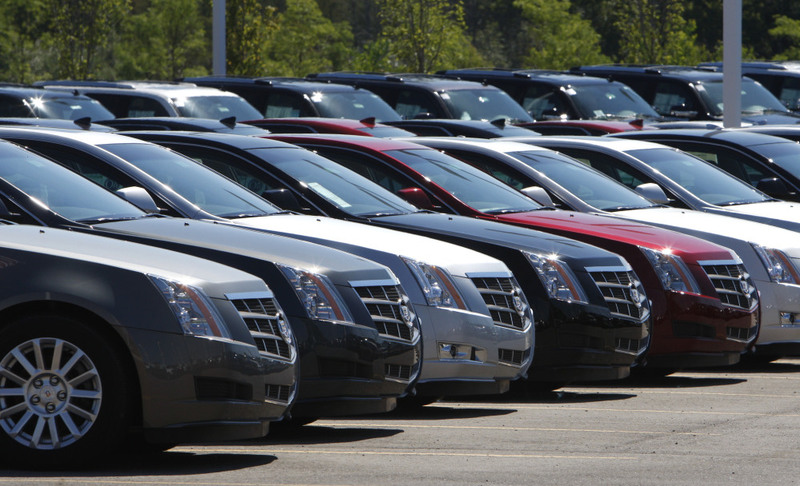 The latest recall, of 8.2 million large cars including the Chevrolet Malibu, happened Monday. • 13: The number of people GM says died in crashes related to ignition switch problems in small cars. • 3: The number of people GM says died in crashes in the vehicles recalled Monday. GM says it doesn’t yet know if the ignition switches caused the crashes. • 165: The number of people GM victims’ advocates say have died in crashes related to ignition switch problems in small cars. • 1997: Oldest model year of a vehicle recalled for a faulty ignition. The 1997 Chevrolet Malibu was included in Monday’s recall of 7.6 million vehicles. • 2014: Latest model year of a vehicle recalled for a faulty ignition. The 2014 Cadillac CTS was recalled Monday because its key can unintentionally rotate and turn the ignition off. • 54: Number of GM recalls so far this year. • 28.9 million: Number of cars and trucks recalled by GM so far this year in North America. • $2.5 billion: GM’s estimate for recall-related costs through the first half of the year. • $7.8 million: The amount compensation expert Kenneth Feinberg says GM would pay to compensate a 10-year-old paraplegic injured in a crash in a small car that was part of the initial recall. Feinberg announced Monday that GM’s compensation fund will begin taking claims from victims and their families on Aug. 1. • 57 cents: Cost of each replacement switch for the 2.6 million small cars. • $35 million: Fine levied on GM by the National Highway Traffic Safety Administration for concealing the ignition switch problems. • $3.8 billion: GM’s net income last year. • 9.7 million: Number of cars and trucks sold by GM globally last year. • 15: Number of GM employees dismissed for conduct that delayed the small-car recall. On the same day, Chrysler recalled almost 700,000 vehicles in North America because its ignition switches – like GM’s – can slip from the “run” to the “accessory” position while driving. The Chrysler action expands an earlier recall of 2010 Chrysler Town and Country and Dodge Grand Caravan minivans and Dodge Journey crossovers. Models from 2007 to 2009 are now included. GM’s debacle caused other manufacturers to investigate their own switches and other potential defects. A recent spate of air bag recalls is probably tied to those internal investigations, said Karl Brauer, a senior industry analyst with Kelley Blue Book. The government is also reviewing the switches. Brauer said he does not think the ignition switch recalls will expand across the industry. Manufacturers all have their own switch designs and use different suppliers. But the possibility is there, and buyers should be aware of the potential for cars to slip into the wrong mode. If a car comes out of the “run” position, the power steering and brakes can stop working, which can cause drivers to lose control. The air bags also won’t function. GM has urged drivers to remove excess items from their key chains that could weigh down the keys. “I think the ignition switch thing is fairly specific to GM, but it will be interesting to see. Were other companies letting their standards fall?” Brauer said. GM’s latest recalls involve mainly older midsize cars and bring its total recalls in North America to 29 million this year, surpassing the 22 million recalled by all automakers last year. The new GM recalls cover seven vehicles, including the Chevrolet Malibu from 1997 to 2005, the Pontiac Grand Prix from 2004 to 2008, and the 2003-2014 Cadillac CTS. The company is aware of three deaths, eight injuries and seven crashes involving the vehicles, although it says there’s no clear evidence that faulty switches caused the accidents. Air bags did not deploy in the three fatal accidents, which is a sign that the ignition was out of position. But air bags may not deploy for other reasons as well. A GM spokesman could not say Monday if more recalls are imminent. But this may be the end of the recalls associated with a 60-day review of all of the company’s ignition switches. At the company’s annual meeting earlier in June, CEO Mary Barra said she hoped most recalls related to that review would be completed by the end of the month. Brauer said the number of recalls – while huge – may be a good thing for the company in the long run. “I think there’s a new standard for what GM considers a potential safety defect, and Mary Barra has no tolerance or patience for potential safety defects that are unresolved,” he said. In a statement Monday, Barra said the company “will act appropriately and without hesitation” if any new issues come to light. Lance Cooper, a Marietta, Georgia, attorney who is suing GM, said he expects even more recalls. A company funded investigation of the ignition switch problems by former U.S. Attorney Anton Valukas found that GM had a dysfunctional corporate culture in which people failed to take responsibility to fix the problems, Cooper said. “Cars got made that were defective. The buck kept getting passed, and this is what happened as a result,” Cooper said. The announcement of more recalls extends a crisis for GM that began in February with small-car ignition switch problems. GM recalled 2.6 million older small cars worldwide because of the switches. The problem has drawn the attention of the National Highway Traffic Safety Administration, the government’s road safety agency. On June 18, the agency opened two investigations into ignition switches in Chrysler minivans and SUVs, and acknowledged that it’s looking at the whole industry. The agency is looking into how long air bags remain active after the switches are moved out of the run position. In many cases, the answer is less than a second. GM’s recalls on Monday bring this year’s total so far to more than 40 million for the U.S. industry, far surpassing the old full-year record of 30.8 million from 2004. The latest recalls came the same day the company’s compensation consultant, Kenneth Feinberg, announced plans to pay victims of crashes caused by the defective small-car switches. Attorneys and lawmakers say about 100 people have died and hundreds were injured in crashes, although Feinberg said he didn’t have a total. Feinberg said the company has placed no limit on how much he can spend in total to compensate victims. But victims of the new set of recalls announced Monday can’t file claims to the fund, which deals only with the small cars. In the original recall, the ignition switches did not meet GM’s specifications but were used anyway, and they slipped too easily out of the “run” position. The vehicles recalled Monday have switches that do conform to GM’s specifications. In these cases, the keys can move the ignition out of position because of jarring, bumps from the driver’s knee or the weight of a heavy key chain, GM says. The cars recalled Monday will get replacement keys. The small cars recalled in February are getting new ignitions. GM also announced four other recalls Monday covering more than 200,000 additional vehicles. Most are to fix an electrical short in the driver’s door that could disable the power locks and windows and even cause overheating. GM has announced 54 separate recalls this year. The company’s stock fell 32 cents, or just under 1 percent, to close Monday at $36.30.